Welcome to Summerfest 2010, a multi-blog celebration of all the most wonderful produce of the summer. For more information on Summerfest and how to participate, click here. I live in Chicago, where we usually have but two seasons, Arctic Winter and Construction. However, the Construction season has a small break which we refer to as Sweet Corn season. Thanks to Worldcommunitycookbook.org for the pic. My family is pretty serious about our sweet corn. We don’t get tempted by shiny ears in the grocery stores, no matter how organic or luscious they look. And god forbid someone suggest something from the canned section! Nope, in my family it is Stade’s or nuthin’. 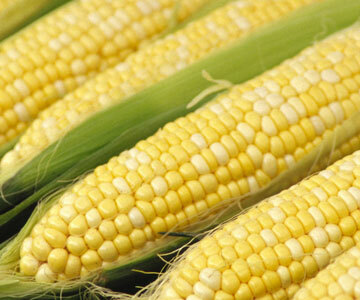 Stade’s is the farmstand five minutes from The Farm, our family getaway, and their sweet corn is completely addictive. Everything else is a disappointment. Usually, it needs nothing but a sprinkle of salt, maybe a slight slick of butter. My Mom can take down three ears in as many minutes. We wait for the big sign to go up that “Sweet Corn is Here” and it’s all corn all the time till the season is over. We bring it to people as gifts. We eat it cold right out of the fridge. My personal stupid human trick is on display from July-August, since my method for eating corn on the cob is both ridiculous and genius. I eat one row at a time, with laserlike precision, leaving a cob so perfectly stripped it looks like a machine has been involved. Or maybe a raccoon. This is the result of having braces for the better part of five years, during which time corn on the cob was supposed to be a no-no. But cutting corn off the cob, while fine for certain recipes, just doesn’t exactly say freewheeling summer BBQ. So I taught myself to gently lever the kernels out with my lower teeth intact, preventing any braces-related incidents and also leaving me entirely without corn stuck between my teeth. When the braces came off, I waiting for Sweet Corn Season, and liberally buttered and salted my first ear. And I bit, with wild braceless abandon. And I hated it. I felt corn juice squirt out the sides of my mouth and onto my cheeks, I got butter all over my chin, and little bits of kernel got stuck in between each and every tooth in my face. Ick. So I went back to my weird and slightly OCD corn habit, much to the horror of my mother. In honor of corn season, despite the fact that the single best way to enjoy it is simply right off the cob, I thought I would share some of my favorite corn dishes! In a wide skillet, melt the butter over high heat. 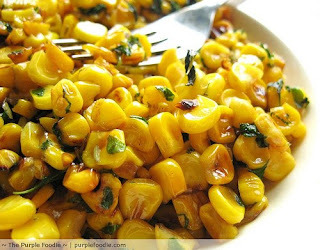 Add the corn and cook, stirring often, until golden and browned (kernels may begin to pop), about 10 minutes. Stir in the mint and sprinkle with salt. Transfer to a serving bowl and serve while hot. Thanks to purplefoodie.com for the pic! In a large skillet, fry the bacon over moderate heat till crisp on paper towels, and crumble. Pour off all but about 1 tablespoon of fat from the skillet. Grease the bottom and sides of a 1 1/2-quart soufflé or baking dish with 1 tablespoon of the butter, coat the surfaces with half the grated cheese, and set aside. Add 2 tablespoons of the butter to the skillet and melt over moderate heat. Add the onion and corn, stir for 3 minutes, and set aside. In a saucepan, melt the remaining 3 tablespoons of the butter over low heat, add the flour, and whisk till golden, 2 to 3 minutes. Remove pan from the heat, add the milk, and whisk till thickened and smooth. Cool the mixture slightly, then whisk in the eggs one at a time till well blended. Add the corn mixture, bacon, salt and pepper, chives and parsley, and cayenne and blend thoroughly. Scrape the mixture into the prepared soufflé dish, sprinkle the remaining cheese over the top, and bake till golden brown, 30 to 35 minutes. Serve hot. Boil cobs with broth and milk for 5 minutes. Discard cobs. Saute shallots in oil over medium low heat until very soft, then add corn kernels and mace. Sweat for 5 more minutes over medium heat. Add broth, a pinch of sugar, and a pinch of cayenne (optional) and simmer for 20 minutes. Let cool and blend until smooth. Strain if you desire a very smooth soup Serve cold with sprinkle of chives and pinch of nutmeg and a swirl of crème fraiche (if desired). Thanks to amysafternoonreading.blogspot.com for the pic! Browning the butter: Place 10 T of butter in a heavy-bottomed sauce pan and heat over medium-high flame. Swirl the pan occasionally to melt butter completely. Place a fine mesh strainer inside a heat-proof bowl; keep within easy reach of the stovetop. Continuing to heat, butter will foam and begin to brown around the edges. Watch yourself, as this may splatter and butter burns are icky. When butter solids have turned a uniform mahogany brown, remove the pan from the heat and immediately pour butter through strainer, separating all but the finest bits of solid from the butter fat. Set strainer lined with butter solids aside. Place butter in the refrigerator to set while preparing cake batter. For the cupcakes: Preheat oven to 350°F. Line 12 standard cupcake tins with paper liners. In a mixing bowl, combine ¼ c butter with the reserved butter solids and the brown and regular sugars. Beat with an electric mixer until light and fluffy, scraping down the bowl occasionally. Add egg and beat until light well combined. In a blender or food processor, purée sour cream with 1 c of corn until smooth. Combine flour, salt, baking soda and baking powder, and whisk to blend. Add about 1/3 of the flour to the butter and egg mixture and mix to incorporate. Mix in half of the corn purée. Add half of the remaining flour and mix just to incorporate. Add remaining corn purée. Mix in remainder of flour and stir to incorporate. Fold in the rest of the corn kernels and the white chocolate chips. Spoon the batter evenly among the cupcake papers. For the frosting: Combine cooled brown butter with brown sugar, ginger, confectioners’ sugar and salt. Beat with mixer until light and fluffy, scraping down occasionally. Add honey and vanilla, and mix to thoroughly incorporate. 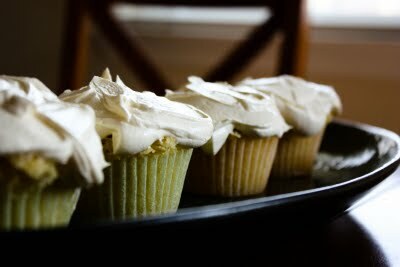 Frost cupcakes and store in an airtight container. thanks to cupcakestakethecake.com for the pic! What are your favorite corn recipes? I am trying the corn cupcakes first! So you're with me on corn straight off the cob!! That said, I cannot argue with sweet corn cupcakes or corn and bacon souffle. Nuh-uh. As for me, I made Grilled Corn Salad with Lime Vinaigrette piled high on Corn Cakes. So yummy. And spicy, too, if you want! corn and bacon souffle... printing the recipe as we speak! once i no longer have to worry about fitting into my wedding dress, i will devour this recipe!!! i LOVE fresh sweet corn on the grill. with butter, with lime juice, with chipotle, with garlic and parmesan... need i go on? i love this time of year when i can eat it with reckless abandoment all the while pretending it IS a veggie instead of a grain! all that lovely corn in so many great recipes! I would love to watch you eat corn...I think you should make a video! its Very nice to meet you!